The client asked for a design that would welcome the public while communicating the dignity of the courts. The Capital Judicial Center reinforces massing, window rhythms, and building materials of historic buildings in downtown Augusta. The lobby is a daylit crossroads for security and the public. Staff, the judiciary, and detainees have their own secure paths into and out of the building. In spite of its imposing size, the new courthouse sits lower on its sloping site than the Kennebec County Courthouse, the Kennebec County Jail (out of the picture, to the left), and the Augusta Public Library (red roof), so it does not dominate the surrounding cluster of historic buildings. Public spaces were designed to maximize views of the Kennebec River, visible through the windows on the right. 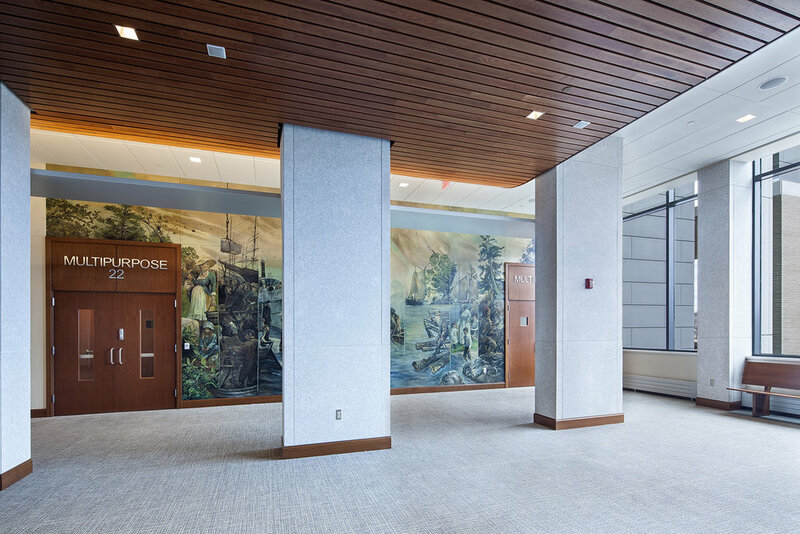 Painter Christopher Cart immortalized members of the design team and the judiciary in the faces of steamboat passengers in one panel of his “Kennebec” mural. 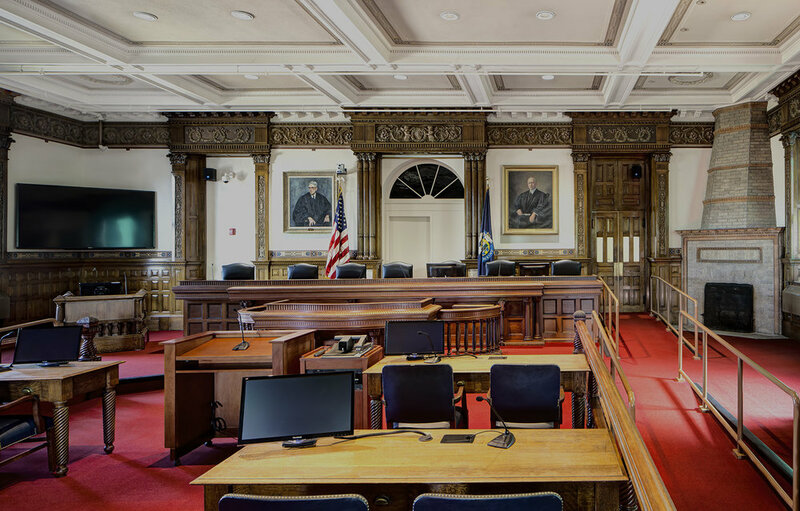 The historic ceremonial courtroom, with new security, AV equipment, furnishings, and sprinklers, and a bench extended to seat all seven justices of the Maine Supreme Court, is open for use for the first time since the 1970s. Courtrooms are carefully designed and lit so judges can see faces and body language of the participants. A 6-inch plenum under the well area in each courtroom allows for the evolution of courtroom technology. Courthouses are also office buildings; the clerks’ office and other administrative areas boast plenty of storage, natural light, flexible systems furniture, and views of the city. Transaction windows are visible from the main lobby to guide the public. The new building is a combined District and Superior Court that consolidates the Administrative Office of the Courts and several other facilities. The arrangement of courtroom sets and the steeply sloping site allowed for four floors on top of secure parking located beneath the entry level. A grand public stair off the main lobby provides views of the Kennebec River, historic district, and the State Capitol Complex.